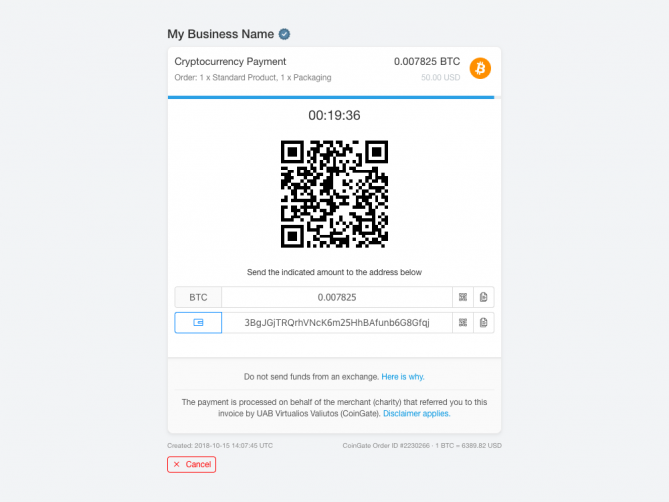 Start accepting cryptocurrencies on your WHMCS site with CoinGate, hassle-free! Receive payouts in Euros straight to your bank account, or in bitcoins to your wallet. With a quick integration of our WHMCS module, customers can make payments on your online store with Bitcoin, Litecoin, Ethereum and over 40 other cryptocurrencies. For a flat 1% processing fee (no setup costs or hidden fees), our fully automated system will handle all customer payments for you. Receive payouts in crypto. Choose to get paid in BTC, LTC, ETH or a combination of the three. No verification procedures necessary. Receive payouts in EUR or USD. CoinGate will shield you from crypto price swings, and convert customer payments in real-time to Euros or U.S. Dollars. The funds will be paid out directly to your bank account in Euros or to AdvCash in U.S. Dollars. Integration and configuration of our WHMCS module is very straightforward, and the payment gateway is fully automated - you will receive automatic payment confirmations and order status updates. We already work with happy website owners that sell services such as VPN, VPS, RDP, Domain names, Hosting, Seedbox, and IPTV, among others. The gateway is fully automatic - set it and forget it. Payment amount is calculated using real-time exchange rates. Set prices on your store in any currency, whether local or crypto. 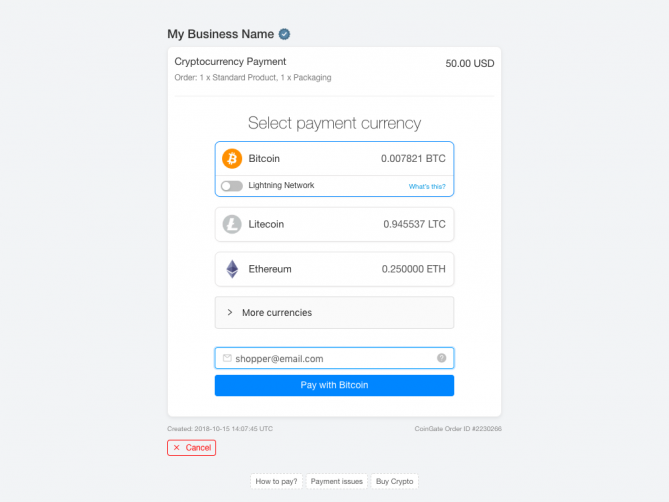 Your customers can select to pay with Bitcoin and 50+ Altcoins at checkout, while your payouts are in a single currency of your choice - BTC / LTC / ETH / EUR / USD (choose DO NOT CONVERT in module configuration to receive a combination of BTC, LTC and ETH). Sandbox environment for testing with Tesnet Bitcoin. No setup or recurring fees - only a flat 1% rate for payments processed. Extend your invoice expiration time (if payouts are in BTC). Refunds can be issued directly from the invoice - without involvement of the seller. An item in the store costs 50 euro. A customer wants to buy the item and selects to pay with Bitcoin. An invoice is generated and, according to the current exchange rate, the price is 5000 euro per bitcoin, so the customer has to pay 0.01 bitcoins. Once the invoice is paid, the merchant is credited 49.50 euro (50 euro minus our 1% flat fee), or 0.0099 BTC. Contact support@coingate.com with any questions! We answer within 24 hours (technical questions may take up to 72 hours - please provide as much information as possible so our developers can reproduce the issue). Perfect work, thanks so much! Powerful plugin and easy to use. Highly recommended. By far the best way to accept bitcoins. Payments are processed quickly and withdraws are easy. Everything works out of the box, including payments callback. This is the kind of module that you setup and forget, because it just works. The CoinGate plugin is working fine, and it could be integrated quickly to our system. Great team, great support! This is an absolutely fantastic module. No need for ID if you want payouts via BTC, simply upload, configure and use. With loads of coin choices for customers to use and low fees for payments, I can't understand why any business would not use this module. We have been using Coingate payment gateway since early december 2017 year and so far no bad word about it! Integration went smoothly, customers are satisfied as their payments are handled at ease and whole process is quick and not time consuming. SEPA withdrawals are transferred in business days within 24h or even faster. Only good words! After look simillar solutions to accept cryptocurrencies, we choose this service for their excellent integration with WHMCS, and ease of use. The service have been working for us during several months without experiencing any issue. Also withdrawals are so fast to our sepa account (usually in 24h). All works excellent. Convenient and intuitive design. The CoinGate payment gateway works flawless . Highly recommended! The WHMCS module works very well. The payment experience is smooth. It's a wonderful solution. The API is working great now!! On the last version of WHMCS, the payments that our clients sent to us through CoinGate weren't being confirmed by WHMCS so we had to do it manually. In that occasion, we investigated that issue with CoinGate API but didn't find anything bad configured, so that was probably an issue WHMCS had with their API..
Now in the new version of WHMCS, this is working perfectly! It confirms the payment automatically and very fast, almost instantly, so we are having a good experience with CoinGate so far! CoinGate payments processing solution works perfectly for us and fully according to our expectations. We are very happy for choosing CoinGate as one of our payments processing partners. Great app and great team. I am using this for 2-3 months already and works great! This really needs to explain in the description somewhere that those running a business in the United States will not be allowed to utilize their services. Many thanks for your feedback. We are sorry you had to go through the trouble of signing up and/or integrating just to find out that we do not serve U.S. businesses. We have now explicitly included this information in the description to make sure such cases don't happen in the future. Since our module works perfectly fine and your review has nothing to do with the functionality of our service, it would be highly appreciated if you could remove or modify the negative review. Support told me was due wrong currency code. But the error log should me more self-explanatory, so 4 starts. Would you be able to check if you could send API requests to us with VEF as the currency? We are sorry to hear that plugin is not working for you. I would like to know what version of WHMCS are you using, because it was tested with all the newest ones and there was no exceptions showing up. Perfect working payment gateway module. Being supported not only the latest WHMCS but previous versions as well. Very happy about CoinGate as payment gateway as well. Great support! Highly recommended!